Wipe caddy with a damp cloth. Glasses are dishwasher safe. Purchased this as a gift for our friends, and they loved it! They love to entertain on their front porch, and gathering all the wine glasses along w bottle and food has always taken several trips inside the house. With this tote no longer. It's strong and sturdy. Great design. The person that ended up with this gift after the game was extremely pleased! I hope she'll enjoy it for years to come! It's super easy to carry outside, just grab your favorite bottle, and carry it outside. Great for if you have little kids running around because glasses can't justfall off of tray. Only thing i'd change is rin include a wine bottle opener. Not having to make trips back and forth to carry glasses and wine makes this tote so convenient and stylish when i walk to my backyard dining table, everyone is at awe when they see this tote and want one for themselves. I will be purchasing more totes in the future for my go to ðŸŽ�. Perfect and elegant birthday gift. This wine tote will be elegant and useful. My friend frequently entertains on her patio and this is perfect. I know she will love it and use it. 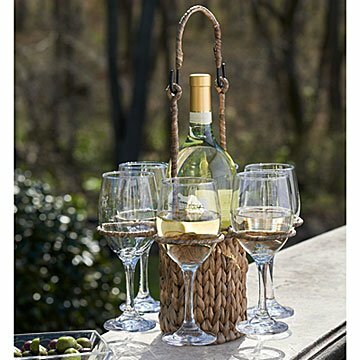 Woven Wine Tote with Glasses - I would buy again. It is a very attractive design. Very functional. When I get reports Iwill let you kow. It was beautiful and well crafted.